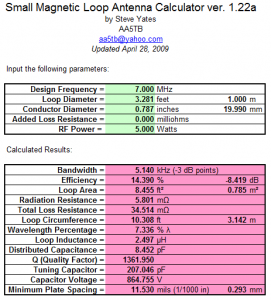 There are many calculators for design of small transmitting loops (STL). This article compares one quite old DOS one and a mature popular modern spreadsheet. 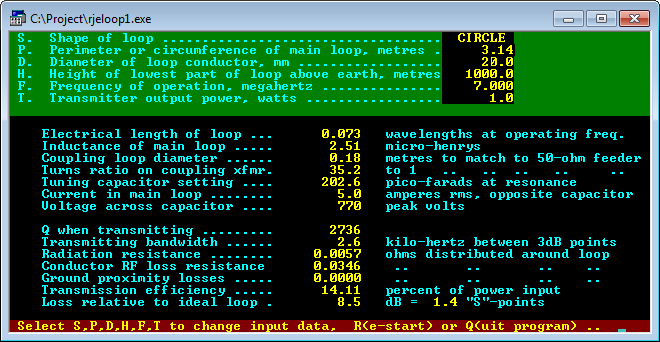 For the purpose of comparison, the test scenario is a 1m diameter loop of 20mm diameter copper at 7MHz. 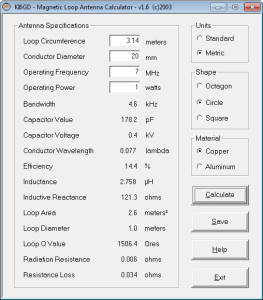 Basic loop calculators need to calculate the inductance of the loop. Calculating inductance is a bit of a problem in that formulas are curve fits to empirical data, and over many years, work had continued in improving the accuracy of the curve fits. For this reason, it can be expected that there may be small differences in calculated inductance and that rolls into subsequent calculations. RJELOOP1 above is from Reg Edwards (G4FGQ) SK. It is basic, but provides important information to the loop builder. 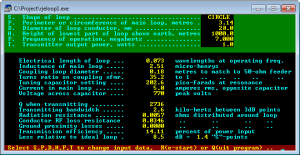 All calculated results reconcile reasonably with accepted linear circuit theory and antenna theory, it is internally consistent and the results are plausible though the ground losses are questionable and capacitor losses are ignored. Above is a screen shot from AA5TB’s spreadsheet for the same scenario. There are several differences to RJELOOP1, so lets work through them from the more fundamental values up. The calculated inductance is very similar (2.50 vs 2.51), that is fine. Radiation resistance (5.8mΩ vs 5.7mΩ) reconciles well. Total loss resistance (34.5mΩ vs 34.6mΩ) reconciles well, but they both ignore capacitor loss and so underestimate total loss. Q is given as 1362 vs 2736 for RJELOOP1, Q is understated by 50%, a huge error. Both calculators come up with a similar value for tuning capacitance (207pF vs 203pF), that is fine. Calculated capacitor voltage is 865V (not identified as RMS) whereas RJELOOP1 estimates 1721Vpk. If AA5TB intends RMS, his peak voltage would be 1223Vpk, a huge difference to RJELOOP and a probably a consequence of the incorrect calculated Q rolling into the voltage equation used. 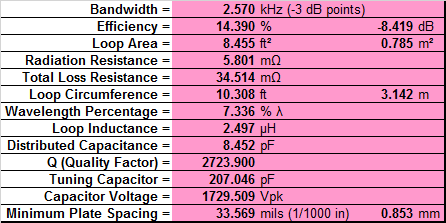 Bandwidth is calculated by AA5TB at 5.14kHz at 7MHz against RJELOOP1’s 2.6kHz. Again this 50% error is probably a consequence of the incorrect value of Q calculated. 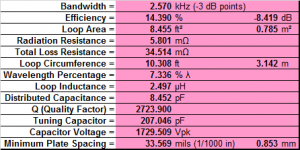 AA5TB calculates the minimum air capacitor spacing at 0.29mm. 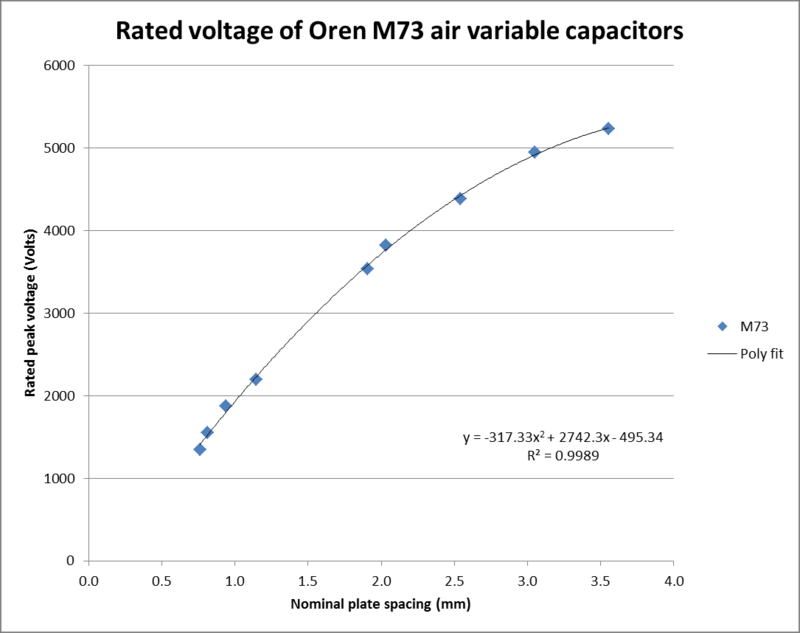 Above is a chart of rated voltage vs spacing for quality capacitors from a reputable maker (Duffy 2011). It can be seen that the minimum spacing for 1721V is abound 0.9mm, about three times that of AA5TB. 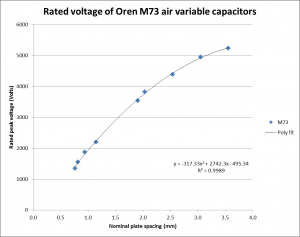 Rating capacitors is a challenge, you cannot simply depend on the dielectric strength of dry air, and failure to include other factors probably leads to AA5TBs very low minimum spacing. Above is a recalculation to fix the incorrect cells. Above, the KI6GD loop calculator on the example problem. It differs in a number of fields, some of the differences appear to be truncation of numbers rather than rounding… pretty basic stuff. 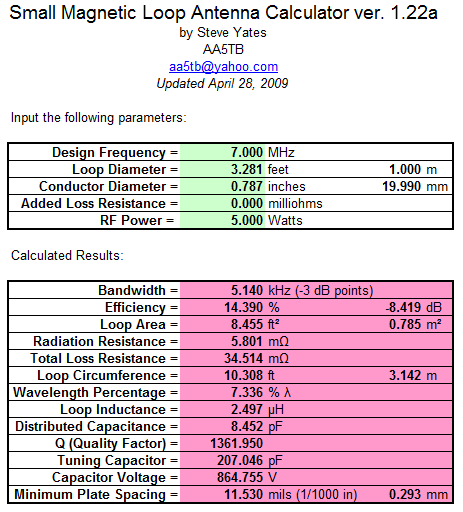 Whilst the conductor resistance is close, Q is very wrong and it looks like the author has followed the ARRL’s flawed formulas which will flow into some other figures (eg BW). Inductance is the same for the three loop configurations which is wrong, the author appears to not understand that. The calculator appears to treat the tuning capacitor as lossless. There are plenty of others that like the last two, are very popular (which is widely held to determine scientific accuracy in ham radio), most suffer from the problems mentioned in last two calculators above. RJELOOP1 delivers plausible results for the evaluation scenario, it calculates most values that a builder needs to know. 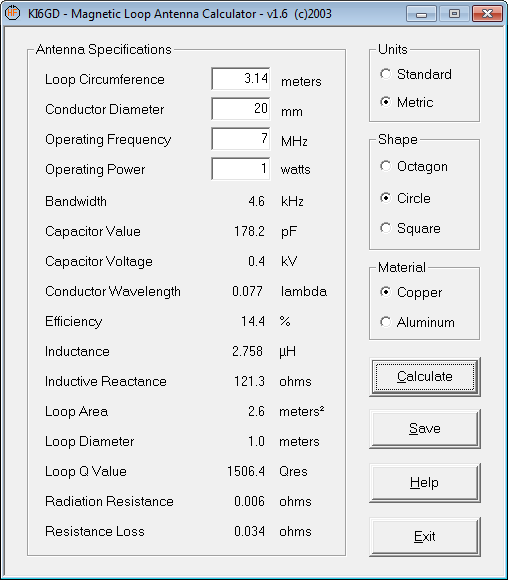 AA5TB’s Small Magnetic Loop Antenna Calculator ver. 1.22a appears to slavishly follow the ARRL publications, eg (Straw 2007) which contains errors as discussed at ARRL Antenna Book 21 on small transmitting loops. KI6GD also appears to follow the ARRL formulas and therefore produces some incorrect results. Ignoring capacitor loss may lead to significant error. Always validate the design tools you use. Duffy, O. Jul 2011. Avoiding flashover in baluns and ATUs. https://owenduffy.net/files/AvoidingFlashoverInBalunsAndAtus.pdf. Straw, Dean ed. 2007. The ARRL Antenna Book. 21st ed. Newington: ARRL. Ch21.